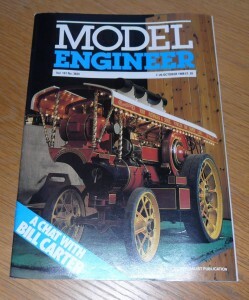 Vol 161 #3834 7th October 1988 of the British Magazine, Model Engineer. Features in this issue includes Ivatt a 3 1/2 in. gauge L.M.S. class 2 tender locomotive, (part 8), Superba – a 2 in. scale model of the Fowler Z7 series ploughing engines (part 3), an eccentric crank engine, renovating a Lathe – by workshop methods (part 3) and starting on boilers. We will ship worldwide..UK postage is only £1, Europe is £3, America and Canada £4..all other Countries please email for a quote.